So, you've just downloaded or created a new song for FoF, and it's being played at very high speeds in-game. You check the guitar and song.ogg files, and the song seems to be fine there. Why is it being sped up in FoF? Just calm down, this is a very common error that a lot of people have when playing Frets On Fire v.1.2.451. It happens because FoF can't handle song files that are set to Mono (1 Speaker) output. Changing a song file from Mono to Stereo (Multi-Speaker) output is very easy to do, and will solve your problem of having the song performed by Alvin and the Chipmunks. First, you'll need to have Audacity installed. If you don't have it already, you can get it here. Next, you'll need to make two versions of the track that you're having issues with. If you already have guitar.ogg AND song.ogg, they'll work fine. Open Audacity, and import both tracks. To do this, go to File > Open, and drag your two files onto the Audacity screen. Do not try to import them by going to File > Open, opening one, and then going back to File > Open again. This will cause a second Audacity window to open, and you won't be able to merge the two files. Just simply click and drag the two files out onto the Audacity window. They should appear as if the first one is sitting on top of the second file. Now, click the little drop-down arrow on the first file. 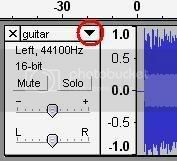 Select the option "Make Stereo Track"
Export the newly merged stereo track as "guitar.ogg". You will need to go to File > Export as Ogg Vorbis for this. If you choose "Save as" it will save it as an Audacity project, not an .ogg file. If you want, you can copy/paste the new file to make a stereo song.ogg as well. Congratulations! You have just converted your song to stereo output, and it should now play at correct speeds in Frets On Fire.